Autumnale, a chestnut-themed cake from COVA Pasticceria – Confetteria, a rather “upperty” Italian restaurant at Paragon Shopping Centre. Too expensive for us for a comme il faut dine-in, and we already had our dessert fix at Canelé Pâtisserie Chocolaterie just barely 2 hours back. So we opted for takeaways from their dessert counter. They offered a good selection of cakes and tarts of all sizes from finger-food to whole cakes but the Italian styling is distinctively different from the French. Pardon my ignorance but my knowledge on Italian cuisine is pretty much limited to the savoury items like pasta, pizzas and delicious rich stews. Tiramisu and Panna Cotta are the only two that comes to mind readily when I try to recall what Italian desserts I’d tried before. Amongst the array of takeaway desserts available at the counter, Autumnale stood out prominently and we decided that Autumnale it shall be! Autumnale is primarily made up of two layers of dense chocolate sponge, not unlike its Austrian counterpart, the infamous Sachertorte. But different from the Viennese delight which usually has a layer of rich fruit conserve (usually apricot) sandwiched between the cake layers, Autumnale’s had fresh cream and bits of chocolate within! The top layer is laced with chestnut cream and piped spaghetti-like strands of chestnut puree, reminiscent of Mont Blanc, only to be juxtaposed with more chocolate cream! This bewildering montage left us very very confused! Indeed, the use of premium chocolate was somewhat paradoxical. 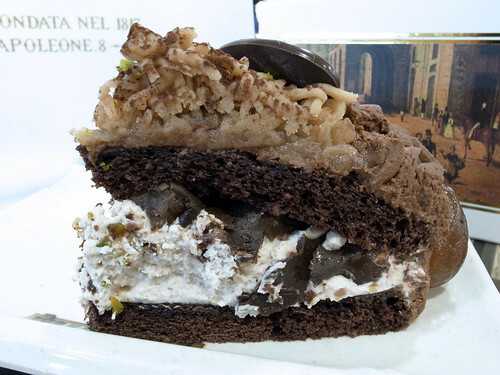 While being rich and dense beyond words, the “chocolatiness” of the cake and the cream obscured the somewhat more delicate and nutty flavours from the chestnut puree. Despite the luxurious and exuberant one had hoped to coax out of this, we couldn’t help but feel a bit crestfallen by the slight injustice done on the chestnuts. These two ingredients would have been prime candidates for desserts in their own right, and a marriage of them seemed to be indeed a very formidable task. Don’t get us wrong, Autumnale is very good already. Just the insatiable voice in us speaking unbashfully.. 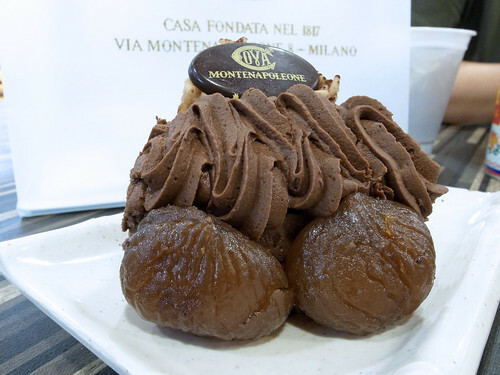 The true gems of this concoction are the two humongously voluptuous marrons glacés positioned subtly at the bottom, making them look… ahem… quite like some endowed person’s “crown jewels” indeed! Despite this le comique est l’ensemble, the two candided chestnuts (or marrons! I can’t really tell the difference!) were simply delish! This entry was posted on December 26, 2010 by Alan (travellingfoodies). It was filed under Food and was tagged with Paragon Shopping Centre, Singapore.